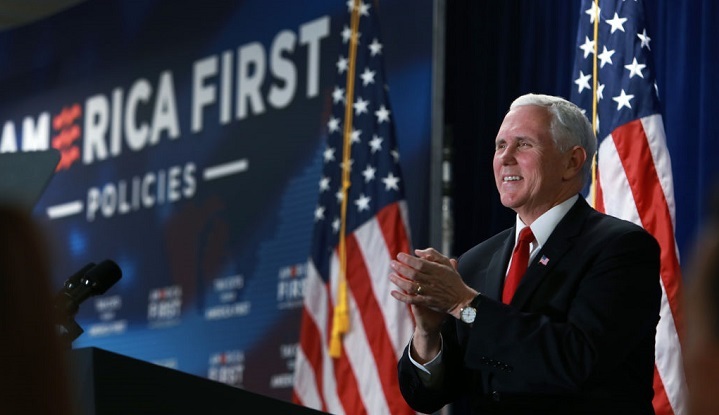 Vice President Mike Pence was the guest speaker at an event hosted by America First Policies in Manchester, New Hampshire in March, 2018. Photo by Jim Davis/Globe Staff. America First Policies, a nonprofit established last year by former Trump campaign officials, has received donations from Southern Company ($1 million), CVS Health ($500,000) and Dow Chemical ($100,000), according to corporate disclosures. Although America First Policies reportedly raised $26 million last year, it hasn’t disclosed any details about its finances yet and won’t file its first tax return until November. MapLight, a Berkeley, Calif.-based nonprofit organization that seeks to expand the public’s understanding of the role of money in politics, has accepted donations from an ideologically diverse collection of donors, including contributions from organizations and individuals affiliated with the Democracy Alliance and George Soros. MapLight discloses its donors publicly; America First Policies does not. “CVS Health contributes to organizations across the political spectrum to help shape public policy and address legislation that has a direct impact on the company,” said CVS spokeswoman Carolyn Castel. She said the company’s contribution was made to support advocacy efforts around the Tax Cuts and Jobs Act, the Republican tax bill passed late last year. "Dow was not aware of any discriminatory actions by staffers at America First Policies. Dow ... will not contribute to America First Policies going forward," said Dow spokesperson Jarrod Erpelding. The corporate donors to America First Policies have benefited from Trump’s agenda in a variety of ways. CVS Health, Dow Chemical and Southern Company all reported lobbying on the Republican tax bill passed in December. CVS, the Woonsocket, R.I.-based pharmacy and retail giant, has said the law will save the company about $1.2 billion this year. CVS is currently seeking the Trump administration’s approval for its purchase of the health insurer Aetna. A tweet from America First Policies celebrated CVS after the GOP passed a tax overhaul. And last year, the EPA reversed its effort to ban chlorpyrifos, a widely used pesticide produced by Dow Chemical that studies show can harm children’s brains. Dow’s former CEO, Andrew Liveris, previously served on a manufacturing council for Trump, and he reportedly attended a dinner that Vice President Mike Pence hosted at his official residence with major donors and corporate executives. Liveris stepped down as Dow’s chief executive in April, after the company completed its merger with DuPont to become the world’s largest chemical firm. America First Policies reported spending $452,000 last year to support former Sen. Luther Strange, R-Ala., in his unsuccessful GOP primary bid, and it dropped more than $1.3 million opposing Democrat Jon Ossoff in the race for an open congressional seat in Georgia. America First Policies has hosted events with Pence around the country this year to promote the Republican tax law. The organization recently announced it would spend nearly $1 million on advertisements to persuade conservative Democrats to back Trump’s pick for CIA director, Gina Haspel. She was confirmed two days later, with support from six Democratic senators. This story has been updated to include statements from CVS Health and Dow Chemical.